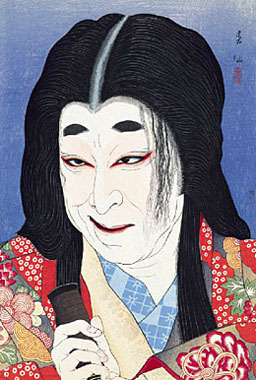 The drama "Hototogisu Kojô no Rakugetsu" was premiered in May 1905 in Ôsaka at the Kadoza, starring Kataoka Gatô III in the roles of Lady Yodo (Yodogimi) and Katagiri Katsumoto [print]. It was produced for the first time in Tôkyô the following year, in March 1906, at the Tôkyôza [casting]. "Hototogisu Kojô no Rakugetsu" is made up of 3 acts and 6 scenes. The core of this drama is the "Hoshiigura" scene, the fourth in this drama. At one time Japan was unified and ruled by Toyotomi Hideyoshi. Before his death he committed his young son, Hideyori, into the care of Tokugawa Ieyasu. But instead of making Hideyori ruler, Ieyasu usurped the power for himself, and for political expediency had Senhime, his grand-daughter, marry Hideyori. Tokugawa has now cemented his control, leaving Ôsaka Castle, where Senhime and Hideyori live, increasingly isolated. However, before destroying the besieged castle, Ieyasu determines to remove his grand-daughter. To achieve this, a Tokugawa agent, Tokiwagi has been sent into the castle in the guise of a serving lady and has managed to persuade several other of the serving women to help her spirit Senhime out of the castle to safety. However, Lady Yodo, Hideyoshi's widow and Hideyori's mother, has become chronically suspicious of everyone in the household and is watching Senhime like a hawk. Her paranoia increases by the moment and she lashes out in accusation against various household members, one of whom she kills. Another, accused of treachery, is nearly driven to kill herself. Then she has Tokiwagi bound, convinced that she is among the conspirators. In a verbal sparring match Tokiwagi rejoins that with Lady Yodo at the helm, no wonder the house of Toyotomi is about to sink. With that, Tokiwaki commits suicide. Next, Lady Yodo turns on a terrified Senhime and grabbing her by the front of her kimono, accuses her of treachery for trying to escape when her husband Hideyori, who is gravely sick, most needs her. The following scene opens with gongs clashing, shamisens strumming wildly, shouts, shots, clashing swords and smoke filling the stage as battle is waged outside the castle walls. In the commotion, Senhime is finally led away to the Tokugawa troops, but when news of her flight reaches Lady Yodo's ears, it will send her over the edge into madness. In the final scene the actor playing the role of Lady Yodo has to excel at showing her insanity. She stares into space, laughs without reason or when someone makes a serious remark, rails unexpectedly at anyone closeby, looks confused and fails to recognise her own son, Hideyori, when he leaves his sick bed to visit her. To maintain the dignity of his clan, Hideyori decides to kill Lady Yodo and himself, but in the end is unable to because of the pitiful sight of his deranged mother. He concedes to the pleas of those around him and agrees to surrender to the Tokugawa troops so that he can protect her until she is restored to her right mind. We are left wondering whether the Tokugawas will let them live long enough for him to see that day. The actor Nakamura Shikan V visited a mental home in the district of Sugamo (Tôkyô) and carefully observed the faces of insane patients in order to portray with realism the madness of Lady Yodo.